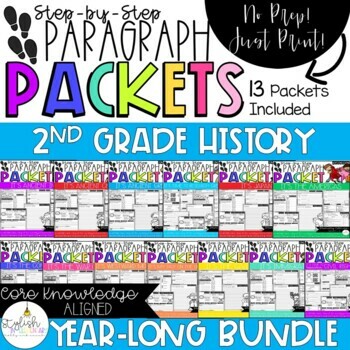 This bundle includes a Paragraph Packet for each of the Core Knowledge history and geography topics covered in 2nd grade! These packets guide students through the writing process and give them the ability to write a well-developed informational paragraph about what they learned after each unit of study. Guided Research Packets for Civil Rights and Greek Gods include QR codes for student-friendly websites. Our paragraph packets are designed to guide primary students through each step of the writing process. The Step-Up to Writing method helps them create a well-developed paragraph that includes a topic sentence, 3 supporting detail sentences, 3 sentences that provide further explanation, and a conclusion sentence. Students will also be guided through the revision and editing process and participate in a peer conference for further feedback, before publishing their paragraph. The format of our paragraph packets remains the same so that students can continue to grow more independent in their writing through familiarity with the layout. **Please download this FREEBIE Paragraph Packet, It's Time to Be Kind! as all packets follow this format!